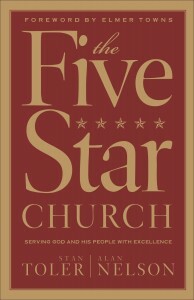 Is your church a Five Star Church? Is your church living up to all of the potential God has placed in your congregation? May I suggest you have a Secret Church Shopper come to your church. Secret Church Shoppers are available to give you an evaluation of your worship service, congregational attitude, greeting, hospitality and so much more. Our shopper arrives unannounced and undercover. The Secret Church Shopper observes your congregation, ushers, greeters, ministers as a typical guest to your services. The Secret Church Shopper Report along with the Five Star Church Facility Inspection are the tools you can use to take to increase efficiency in ministry, focus on vital improvements, show strengths and weaknesses in volunteer areas. The Secret Church Shopper and Church Facility Inspection are highlighted in the best-selling book Five Star Church by Dr. Stan Toler. This book has changed hundreds of churches from average to Five Stars. In fact, Dr. Toler regularly has his own church visited by a Secret Church Shopper. Do you know what your guest think about your church when they visit you? Do you wish you could interview your guest to determine why they attend (or no longer attend) your service? Now you can benefit from a professional Church Shopper. A confidential report will be delivered to the Senior Pastor once the Secret Church Shopper has visited your church. Many pastors have said they use this report to give to staff members, board members or lay-leaders to make immediate improvements. Churches of all sizes and faith backgrounds have used our Secret Church Shopper services. For a free brochure click here and send an email. © 2019 Secret Church Shopper | Church Worship Service Evaluations.